One of the vases on this band is done now, so two more to go. I think I'm not taking this with me to Europe. There's no great urgency to finish it, and I think I need a break from it, too. It'll be in my rotation to do until I go, and, in fact, will be what I'm working on today. I got more of this light green done over the past week, making the pointy middle things. Filled it in some with the darker gold petite treasure braid, too. I really need to get back into the swing of doing more stitching, but things are still hectic. At this point, I doubt they're going to calm down before I go to Europe. Just so much to do! This one will also go with me overseas, and I hope to finish it there if I'm not too busy. Either I'm going to be really busy during the days doing research, or not busy at all during the days. Time will tell. 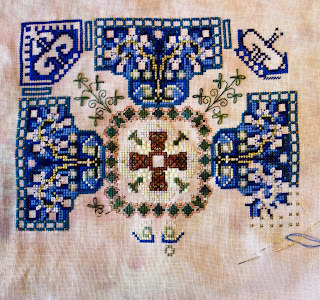 Gold outline and another shade of blue added to the fourth corner; it's coming along. I've decided this is one of the projects going to Europe with me in two weeks. The airline into my final destination allows only forty kilos of checked baggage, and I'm going to be there for just over a month! So I've got to be really careful about which projects I carry along with me. I'm mailing a couple to myself too. This picture was taken only a couple of days after the previous one, so there's not much difference. Mainly, if you look at the lower part of the flag, you'll see more red put in. It's progress, at least. I'm over halfway done with this heart; it helped that I was trapped in a medical office waiting room for a couple of hours and had this along. It wasn't easy because there was no table, but I managed to do some beading anyway. Since this picture was taken, I've finished the project - but - no picture yet, as my husband has a camera in another state. It's my April ornament for ornament of the month. Somehow I missed getting a picture taken of this one week. As you can see, I've got the spiny leaves done and have started on the central flower. It was a pain to split stitch, but it's coming along nicely now. The satin stitch overlay looks pretty good to me. I will be working on this on Sunday in order to do some catching up. I started this on the way home last Saturday from Pittsburgh. The spider webs went really quickly and I think it'll take a lot less time than the guitar did. I got the large crescents done this week and started in on four triangular Jessica stitches. They go quickly and are fun to do, though it's hard to slide the needle beneath that many threads toward the end of the stitch. I'll finish up the other three triangular stitches next week. I thought this band was going to go a lot more slowly than it is, most likely because it's so wide. I started in on the Lady's hair. She's blonde, and she's coming along a bit more now. The week was weird; I had a trip and I just cannot cross stitch on the roads here. They're too bumpy. So she's got progress, but not as much as a typical week. Much better than none at all, though. I finished up Cobi's block earlier this week. The top picture is of the overall block; I found it hard to add things, and ended up leaving one patch blank because of the way the bow tail went through it. Below are the bits I did. I added the bee and the monogram in this picture. 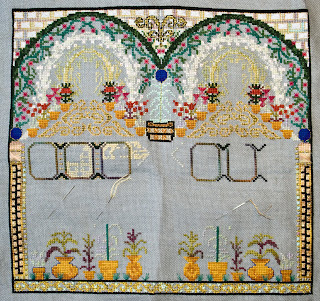 The bee is in several stitches with petite treasure braid and ribbon; the monogram is in three rows of stem stitch using silk. In this one I did the herringbone stitch seam in ribbon and the bead and silk flower cluster. 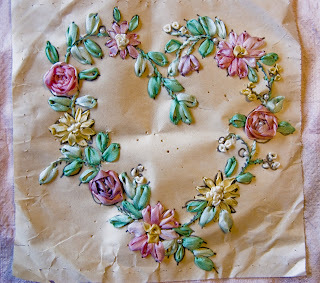 I guess doing that silk ribbon class has made me want to experiment some. I did the bead seam treatment in this picture. It's a fly stitch with the spine in one color and the outliers in another. I like the effect and will use it again. Another bee here, done in a different manner. 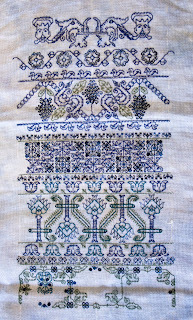 I got the pattern for it from some Jacobean embroidery plates. The bee up top was one I sketched myself. For this area, there was a print on the fabric that just needed some oomph, so I did some outlining and emphasis on it. The block was mailed back to Cobi yesterday. I hope she likes it when she gets it. I am one of those people who hate waiting without doing anything, ergo I have a car project. Especially on long trips, it gives me something to do. This afghan has been my car project since last summer and I finished it on the way home from Pittsburgh on Saturday. It'll be going to the local VA hospital to be used. Now I have to remember to put a new project in the car. Yay, I received my block back from its trip to others. Thank you Cobi, Debbie, Jill and Melissa for working on it! I'll be making it into a wall hanging when I get back from my trip. I like how it turned out. When you send things out like this, you never know how it will turn out. I'm very lucky because it came out in a way I like! This block is the last one in the group for me to work on. It's Cobi's and it's been a challenge to figure out what to do with it. I knew as soon as I saw it what I wanted to do with the lower left corner. The rest - I had no clue. This picture is before my work. I completed it last night after working on it all day Sunday and yesterday. I'll post pictures of the work I did on it later. The filling's coming along, it seems. I'm definitely over halfway done with the third quarter, which makes me feel good, even if others are working on the ninth part. I never keep up with the releases of the chart parts of these, so it doesn't bother me anymore. I'll get it done and it will be beautiful. I finished putting the fringe on the shawl on Thursday and mailed it out on Friday. My son watched me put the fringe on and said it was a lot easier than he had imagined it would be done. I think I'll probably make a few more of these for Christmas gifts and so on. They're quick and easy and warm and sooo soft. Didn't learn anything new in doing it, but that's okay. I've started more than the outline of the band now, startng in on the pots. There's quite a bit more to put into the middle of each of the three areas, but at least it's coming along. I finished this piece back in January and my husband finished the frame on Thursday. I think he did a really good job of it. When it was given yesterday, everyone admired it. The top picture was taken on Friday last. The other two were taken last Saturday. As you can see, I finished it rather quickly. 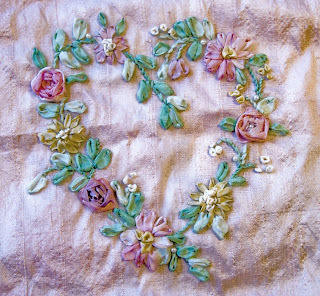 That's the big reward of silk ribbon embroidery: it goes quick. 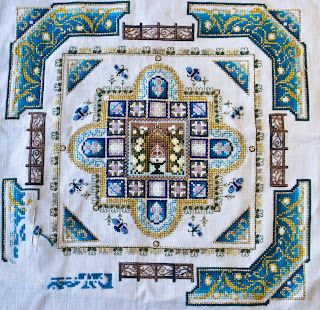 I learned some about stitching with silk from the course. Really not pleased with the color choices, but ... that wasn't the point of me signing up. I've got some confidence in this technique and will probably start using it in some of my projects, especially ones where I want a quick lift. I hadn't planned on making this, but there's a friend who's going through a very hard time, so I thought I'd make her a comfort shawl. I'm using Angel from JoAnn fabrics. It's very soft and not hard to work with. It's between a worsted and a bulky weight. This is also really easy to do, since it's just a rectangle of double crochet stitches. I hope to mail it out on Friday; if I don't, it'll be in the mail on Monday. I'm that close to having it done. 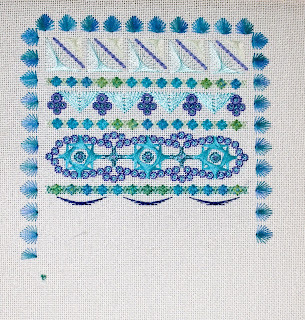 This week it was the metallic gold in between some of the bars and the half stitches of celadon green. At least I'm making progress now. For a little while there, I was worried that I was getting bogged down in too much other stuff going on around me. Back on track and ready to move forward to a finish by the end of the summer. I'm feeling a sense of relief regarding this piece now that I'm on the fourth quadrant. There's already quite a bit stitched on it, and I hope to have it done in about a month. I really love this design and the colors are even more vibrant in person. This week I did extra work on this and finished the third band. It went pretty easily, though I'm not sure I like how puffy the herringbone stitches turned out. Band four is another single color one without a whole lot to it. I hope it only takes a week or two. She's got a neck now and the beginning of a face. 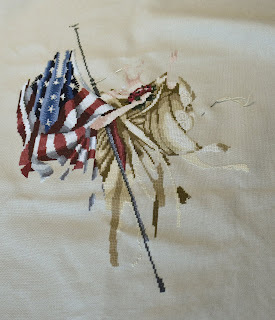 The roses are almost completed too, and I've stitched a bit more of the flag. This week I made more progress on her than I have in quite a while, so I'm satisfied. Now to hope I can continue the pace. This week I finished the starfle row (yay!) and started in on the fourth of five big bands. 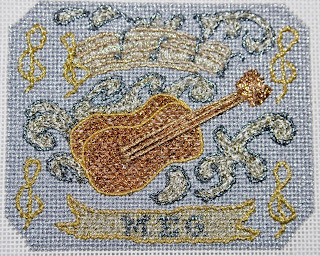 Band four has crescent stitches and more string art stitches in between them. 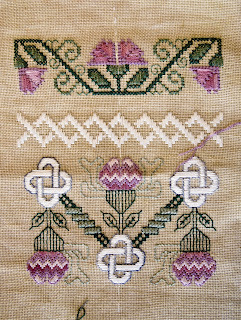 The first row of crescent stitches took very little time, so hopefully the second row, this week, will too. Not much done, but some on this. The black parts of the v's are in, as is some more celadon green inside a couple of the plaques. The dark green is added on the left, too. It's getting there despite the setback last month where I misplaced the line of plaques. I'm ahead of the point I was at, which is progress indeed. With all the little bits of color around the flowers and the upper edge of the dress, I've been having floss leftover when I do them. So I've been using it to expand the skirt. It means when I get there, I'll have less to do. The piece is getting to the point where I feel the top half is almost done. All that's really left is her arm, her head, and the top of the flag. One down, eleven more to go. My only hope is that the stitch guides get better. The actual stitching wasn't difficult, though several of the fibers tended to shred a lot. I've decided I don't like Gold Rush. The sparkly allows the underlying white to show through too much, too easily. I'll be waiting to finish this into something when the other eleven are done. When this picture was taken on Saturday, I still had over half of the background left to stitch. I'm happy to report that I finished stitching it yesterday. Even though getting around all the other stitching was hard, it went pretty quickly when I put my mind to it - and my time. This was sitting on my desk with the back and front sewn together for weeks. This weekend, I finished it off and I like the looks of it. I could have picked light colored beads, but decided to go with the dark ones to add more contrast. It feels good to have something completely finished off, especially after the last month when I got nothing done. I got a bit more done on this, doing stem stitch on the long leaves. They're two toned, for shading. As usual, this goes quickly when I have time to work on it. I'm hoping to have more time than usual to work on it this week and move it forward quite a bit. The knots on band three are nearly done now. Only a little bit to fill in on the last. I'll be working on it this week and hope to get this band to completion. I really do prefer the horizontal lines on the filling to the diagonal ones. It was a lot easier to do and, I think, gives a smoother line and looks better. I'm about three-quarters of the way done with this starfle row, and will be starting another bunch of string art stitches next. I'm just glad I got to working on this at all this week. It's been that kind of day. Three bands done and two more larger ones to go, though none, I think, with the hundreds of little jessicas again. Yes, it's the first week of April, but I just finished my March ornament. It feels good to finish something - I only completed two things in all of March. January's overproductivity must be catching up with me. I did get quite a bit done today, so maybe I'll get on an upward trend. Anyway - this was a really easy stitch and I think it turned out pretty well. I think I'll finish it into a little pillow ornament. Two more lengths of floss into the design this week. Both colors finished on the third side and stitching partially into the fourth too, so I can't complain. March's ornament is getting there, despite March being gone. I'm falling behind on so much I'm beginning to feel guilty about it. This has gone easily, at least. I finally began my project from a class that started in the middle of February. It's from Vickie Brown of Ribbonsmyth. The first lesson of the class was all talk and no do, so I kind of tuned it out. I went back to it last week and finally started. Lessons one and two are done on this, and I hope to do lesson three later today. 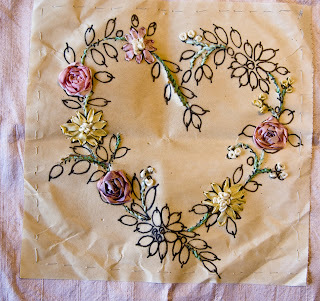 Silk ribbon embroidery is a new thing to me, so hopefully I'll learn quite a bit doing this. Finally, the third corner's complete. I haven't gotten any further than this in the days since the picture was taken, but it's done. The fourth corner is well started, too. Now I just need to find time to stitch. A bit more on the flag and on her skirt got done this week. Still suffering from lack of stitching time, though. Her roses are coming along; hopefully I'll have at least those done next time I post.